During your next 20 turns (even if Ninga is knocked out), you may heal 100 damage from ALL Pokemon in play. 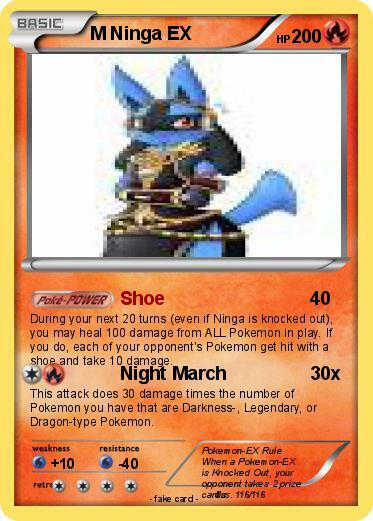 If you do, each of your opponent's Pokemon get hit with a shoe and take 10 damage. This attack does 30 damage times the number of Pokemon you have that are Darkness-, Legendary, or Dragon-type Pokemon. Comments : Pokemon-EX Rule When a Pokemon-EX is Knocked Out, your opponent takes 2 prize cards.